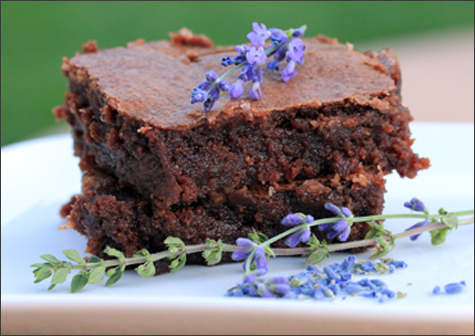 I’m including the main course and dessert in this last lavender cooking post. 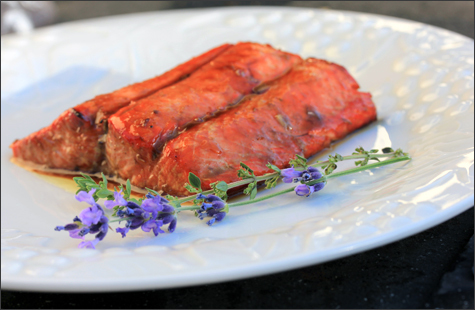 We tackled Grilled Salmon with Lavender for our protein of the evening. I was happy to see that Kim added cedar plank cooking to the recipe. Sweet! Glad I had already tried it… I asked her if she has ever been able to re-use a plank… her answer was no. So if you find planks on sale – I saw some this weekend… stock up! Lots of Summer and BBQ sales going on right now. Kim purchased some amazing Copper River salmon – Alaska’s premiere wild salmon. The pieces were gorgeous! She did most of the pin bone removal, but I caught some stragglers with a pair of pliers. See? I learned something from my last post on salmon. We got to work on the sauce we would be using on the salmon. Place all ingredients in a saucepan over moderate heat, stirring with a wire whisk at all times until ingredients are reduced by one third – you want the sauce to thicken. When sauce has cooled slightly, brush on the salmon fillets. 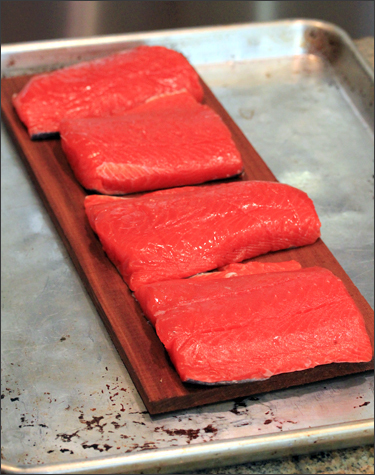 We placed the salmon (skin side down) on the soaked cedar plank while getting the BBQ ready for grilling. 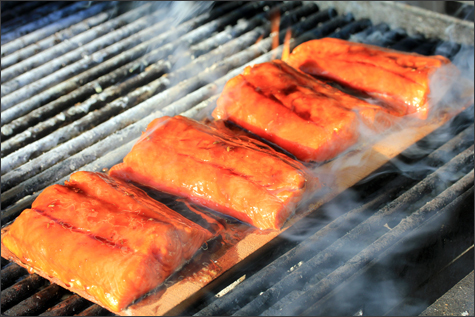 I coated the salmon pieces with the sauce and brought them out to the BBQ that was set on high. Total cooking time was about 20 minutes. I opened the BBQ lid at 10 minutes and coated with more sauce and then turned the heat down to low. The plank was charred… however, the smell coming from the BBQ was wonderful. I easily removed the skin before plating. The sauce was delicious, but I preferred the lemon and dill combination from my previous salmon post. Our sauce was a little too sweet and needed something to balance that out. Once I added salt to my salmon, I was a happy camper. The quality of the salmon was superb. 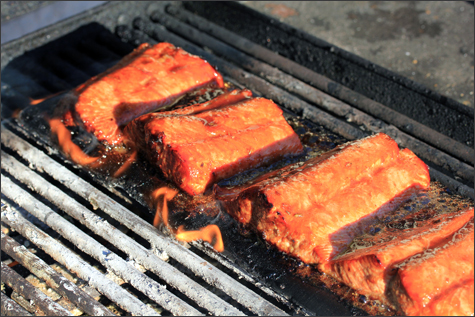 Just last night I grilled salmon (Yes, I’m a little obsessed now) using a soy sauce, dijon mustard, olive oil and garlic marinade and something about the salmon was off. the marinade was perfect, the piece of fish I got was definitely not Copper River… and rather than eating a bunch of “not so top notch” salmon, I’d rather occasionaly splurge on the good stuff. Lesson learned. 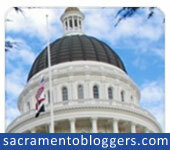 I’m really sticking to my grocery budget – so far so good for the month of July. Now for dessert. 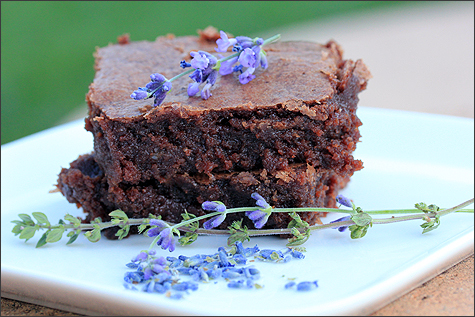 Chocolate Lavender Brownies were on the menu for the evening. Marnie and Jaime got to work on the ingredients while the rest of us enjoyed our cocktails. Preheat oven to 325 degrees F. Butter a 13 x 9 Inch baking dish. 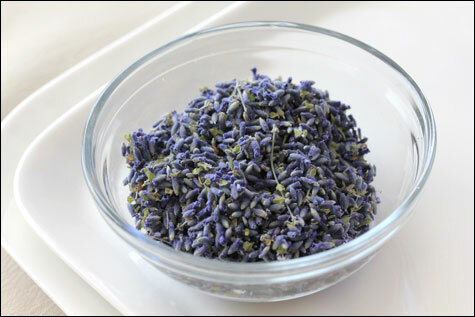 Place the lavender in a spice grinder with one tablespoon of the sugar. Pulse until the lavender is finely ground. Transfer to a large bowl. Add flour, cocoa, salt, espresso and the remaining ingredients, mix well. Place the butter in a medium microwave-safe bowl and microwave on high power for one minute at a time until melted. Let cool for a few minutes and then whisk in the eggs and vanilla. Make a well in the center of the dry ingredients and pour in the wet mixture. Using a wooden spoon, mix until just combined. Pour into prepared pan and smooth the top. Bake for 35-45 minutes, until a toothpick inserted in the center comes out mostly clean. The verdict… So much butter… while the flavor was amazing, I couldn’t get over how greasy they were. I would definitely dial back the amount of butter. Trust me, it didn’t stop any of us from mowing through our pieces… but man were they rich. I did indeed taste a hint of the lavender and I liked it a lot. Next time I might even add a little more.Super moist and chewy for sure. I can’t say enough about how much fun I had during the entire lavender cooking experience. Cooking with a group of friends leads to great discussion and sharing of ideas. I’m excited to get started on planning the menu for when I host. I’m definitely going with a “corn” theme as I’ve recieved a lot of great ideas from readers and it seems to be featured in food magazines this month. We also threw around the idea of incorporating a book into our themes… Children of the Corn is out… ha! ha! – still on the search for one. I just ordered several culinary themed novels, so we’ll see. Thanks for following along the past few posts and I promise, non lavender posts are headed your way. 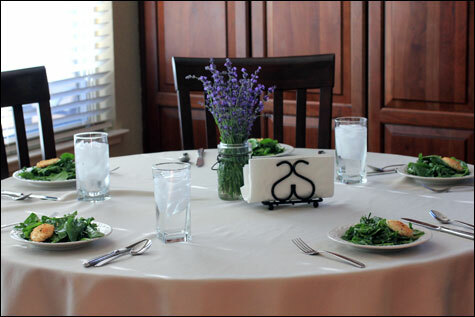 So I left off at lavender appetizers and cocktails… and now I will introduce the salad and our side dish in this post. I think the salad was one of my favorite dishes of the evening. It was easy and elegant at the same time. The dressing was incredible. The goat cheese theme continued… and then it got stinky with some blue cheese in the side dish. 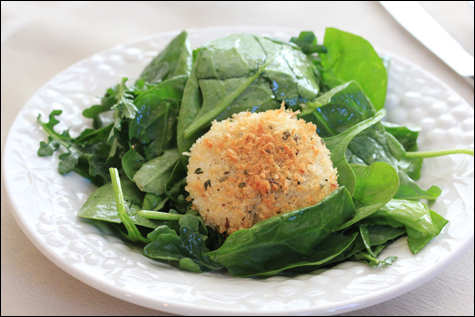 Spinach and arugula dressed with a lavender honey vinaigrette – topped with baked lavender, thyme and panko crusted chèvre. 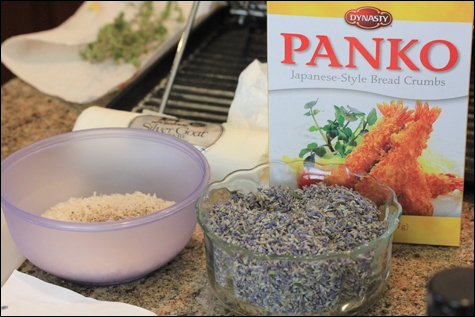 Directions: Combine bread crumbs, fresh thyme, ground pepper and ground culinary lavender in a bowl and mix. There were no measurements involved… just a pinch here and there with the lavender, thyme and pepper – enough to coat the goat cheese medallions before baking them in the oven. 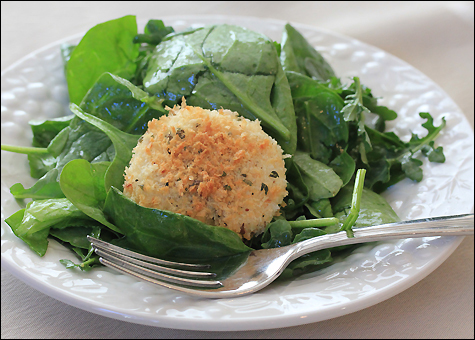 Bake until the panko gets crispy and serve warm on the bed of dressed greens. Notes from Kristen: The Chèvre sliced horribly, it fell apart in the coating… had to form patties to coat. Perhaps a dip in olive oil would help the panko stick better. Directions: The dressing was made in a jar. The amount of oil varies depending on how much juice you get out of your lemon. There was lots of tasting between jar shakes and adjustments were made. Notes from Kristen: Not much measuring with the dressing since it was a basic vinaigrette. 1/3 cup oil – 1/2 that amount of lemon juice. 2 tablespoons honey, 1teaspoon Dijon…no measuring of spices – just several twists of the grinders – taste – adjust. Might use regular honey next time and add lavender to the dressing, since it was a little difficult to detect the presence of the lavender. The recipe could easily be adjusted for thyme, rosemary, basil, etc., just use the same in the coating and dressing. Kristen had the toaster oven set to 350 degrees F. so the cheese wouldn’t melt too quickly before the panko browned. It took about 15 minutes. We ended up transferring the cheese to the conventional oven to speed up the process. I grabbed a second cheese medallion because I ran out of the first one and still had greens left… at least that’s the story I’m telling here. OMG, they were fabulous… and the dressing will be made over and over by me for sure. Since Kim made the lavender honey ahead of time, I wasn’t sure what was needed – so I did some research on my own. 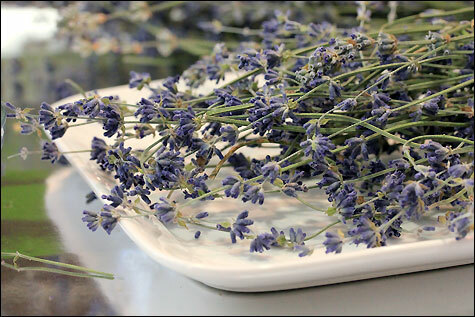 Put the lavender flowers and honey into a saucepan over medium heat to gently warm. Stir and mix together the lavender flower and the honey. Allow it to sit over the lowest setting for gentle heat about 1/2 hour then pour while it is still warm into a container that has a lid. A glass jar would be good. Set aside for a week or so in a cool place, then strain out the flowers and re-bottle. Note: You definitely need to plan ahead by making the lavender honey… or you could just purchase it from Amazon, HomeGoods, World Market, Whole Foods or some other specialty store. This was the dish given to me. I was emailed the recipe and I honestly didn’t really study it until I got to Kim’s on Saturday. Things were kind of crazy with hosting 4th of July at the house. 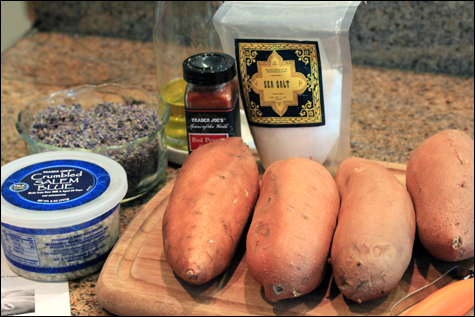 I’m a huge sweet potato fan… not a big blue cheese fan, but I was interested in how everything would taste together. Put cut up yam into a plastic bag; add salt, pepper and olive oil and shake yam sticks until they are coated. 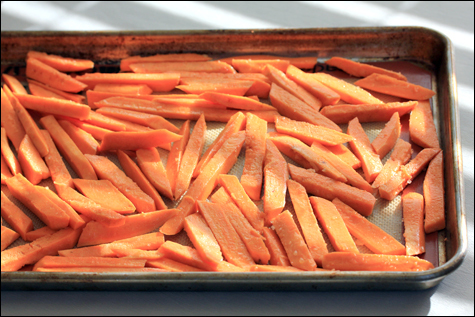 Line baking sheet with parchment paper (we used a Silpat silicone mat) and place fries in a single layer. Bake in oven for 20-30 minutes. 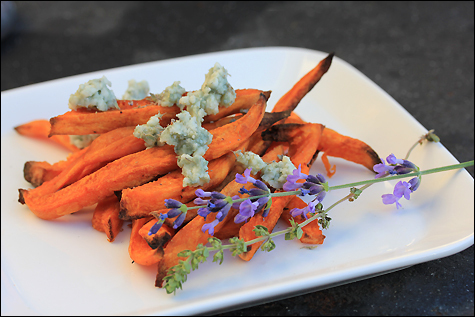 Remove from oven, place on serving plate and sprinkle with blue cheese crumbles, lavender and more salt. The fries took the entire 30 minutes and they never really got crispy – deep fried would have been the way to go for perfection. I heat from the cayenne lessened with the addition of the blue cheese. I think I might have gone a little too light on the lavender, I ended up sprinkling a little more on mine so I could really taste it. Both dishes were successful – with some minor tweaks, I think they could pair well with just about anything. 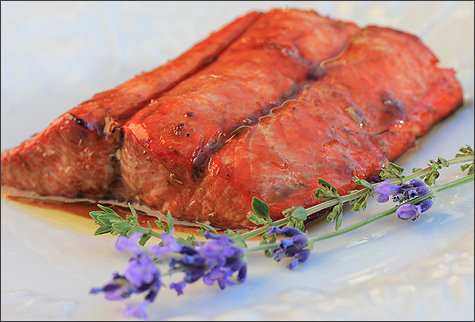 Next up – another stab at salmon – Cedar Planked Salmon with Lavender and Chocolate Lavender Brownies. I promise that will be it for lavender – I just got really excited about my new cooking group and wanted to share all of the recipes we used. A couple of months ago I received an email from a friend inviting me to take part in a culinary adventure. She had been wanting to get a group of girlfriends together to cook and share different techniques, ingredient use and found recipes. How it started… Kim was sharing a meal with her daughter that ended with a lavender and strawberry shortcake dessert with lavender infused whipped cream – She thought it was delicious. 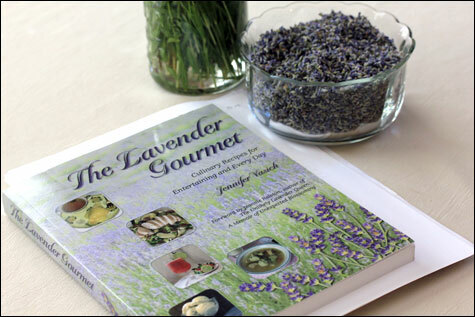 This started her quest to learn more about growing her own culinary lavender. Kim wanted to share what she had learned with all of us and I was happy to accept the invite. She purchased some organic lavender plants from an herb farm in Vacaville, CA. She grew them, harvested them for bundling and drying and did a bunch of research to help plan our menu for the evening. The emails were flying back and forth and just like that, our new gourmet group was formed. 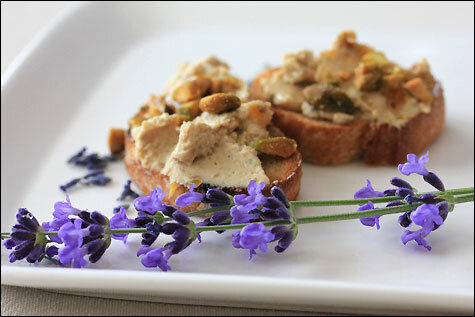 Cooking with Lavender was our first topic, and I’m hosting the second – any ideas or suggestions? I was thinking about using corn. One of the group members voiced some concern over it being too limiting. I’ve actually found some pretty cool recipes and so has Kim, so it might still be an option – maybe combined with something else to make everyone happy. Kim pointed out the differences in the lavender she had for the evening. 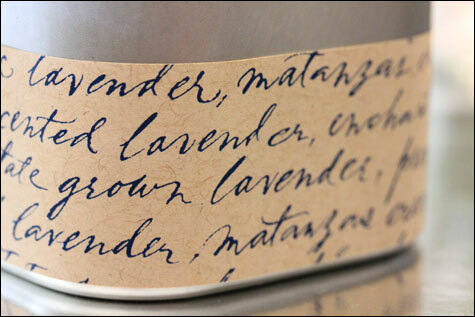 Provence lavender has pale blue to purple blooms and with English lavender, the flowers are pinkish-purple. 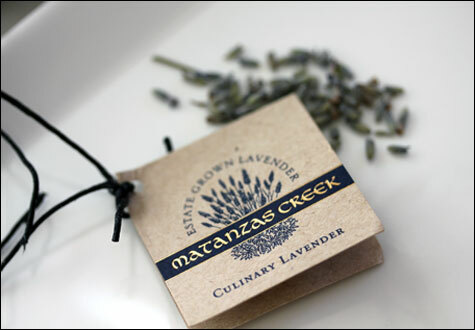 English lavender has the sweetest taste of all the lavenders and is most commonly used in cooking. She had also purchased some from a boutique for comparison. She explained that a little goes a long way. Our biggest concern of the evening was to not create a bunch of dishes that tasted like potpourri. The potency of the lavender increases with drying, so we used very little – sometimes questioning… Can you even taste the lavender? 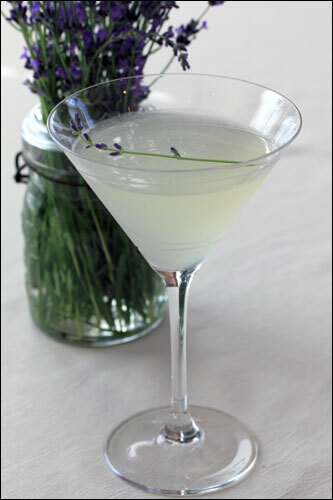 Our menu for the evening started off with Lavender Lemon Drop Martinis. Add all ingredients in a martini shaker full of ice. Shake to combine and strain into the prepared martini glasses. Garnish with a sprig of lavender. Note: My martini was made with 1.5 oz. of vodka and 1.5 oz. of water after coughing when I took the first sip of the strong one. Ha! Ha! – I’m a total lightweight when it comes to drinking hard alcohol. I switched to lavender lemonade as the night went on. 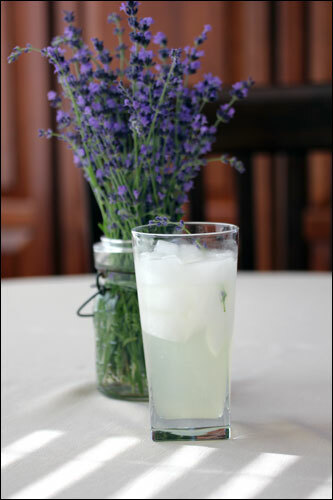 Kim used the same lavender infused simple syrup and fresh lemon juice for my lemonade. Next on the menu was the most incredible appetizer ever… Goat Cheese and Lavender Crostinis – No joke, I probably ate 10 of them. I don’t have the ingredient amounts, Kim made the appetizers ahead of time and went by taste, not a recipe. A small amount of ground lavender was added to the goat cheese, along with fig jam/butter and chopped dried apricot and then mixed together. The baguette was sliced and toasted and then the cheese mixture was spread on top. 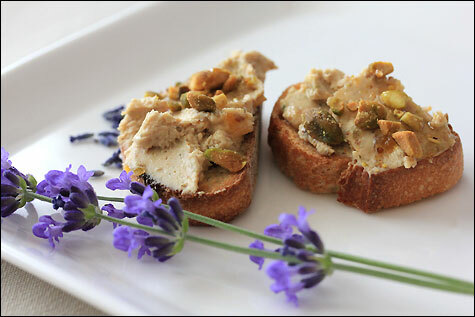 Pistachios were then sprinkled and honey was drizzled over everything as the finishing touch. We also had Roasted Olives with Lavender and Truffle Oil. I unfortunately failed to get a photo. They were served on a pretty glass plate. The third appetizer of the night was a lavender goat cheese served with Trader Joe’s Raisin Rosemary Crisps. All three appetizers were absolutely delicious. Three appetizers and cocktails was a pretty fun way to start off the evening. We all took turns creating the dishes assigned to us. I will post the other courses in part II and III. I probably ended up with over 100 photos. Rounding up the recipes has been the hardest part – I think I’ll make little booklets for our next group get together or then again… I could take better notes. 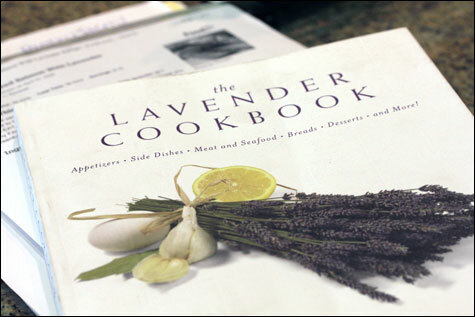 Have you cooked with lavender before or tasted any dishes that used lavender? I really thought it would overpower everything, but it was such a nice compliment. Kim sent us home with our own jars of lavender and I look forward to experimenting in the kitchen with mine. Cheers to a wonderful night of cooking and dining with good friends… Thanks Kim for the idea and including me in the group.